This year, I was sitting with a rather baffling question. What if there is a kind of successful product in the market, you do lots of research and such. But in the end, you still ask yourself: so what are those users really doing there? You can always ask them nicely. But you know, there’s this difference between stated preferences and reality. Ask people, and they read the NY Times and watch CNN. See the data, and you won’t believe what happens next. Right. Stated preferences mostly reveals more about the guy asking than what’s really going on. People try to keep up appearances. That’s the human condition. If you’re not a registered sociopath or a saint or another type of fringe personality. All users lie. But only if you ask for it. Guess what. There’s a really nice solution out there. Because the problem of not knowing what your customers really do and want is a fairly common one. Clayton Christensen, professor at the Harvard Business School, came up with the concept in the 90ies. Jobs To Be Done refers to the core concept behind: people don’t buy “a product”. They “hire” a product to get a “job” done. Have a look at those four guys in a subway car. 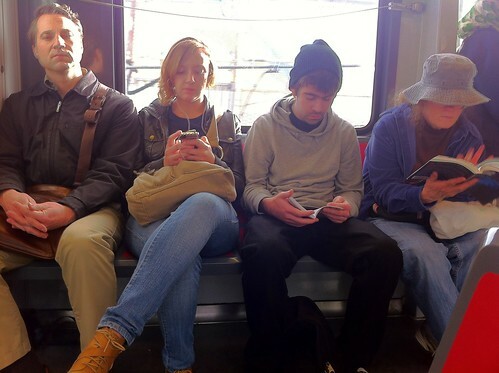 The “job” is always the same: How to not get bored on a subway ride. But three totally different products got “hired”. A book, a smartphone, a magazine (we don’t know about the gentleman to our left). But that’s not the hard part. The hard part is finding out what the job really is people hire your product for. Think about a newspaper publishers. A weekend issue of the NY Times is a nice thing to stack up in your spacious living room. But unfolding it on the A-train needs lots of manual dexterity, yogi-like body mastery and a certain disregard for the people sitting next to you. It took decades to come up with newspapers sized for subway rides (and no, the NY Times isn’t one of them). One job, 3 different products hired. You want more? Watch Christensen a bit more in detail. To get to the bottom of the jobs question, you start with interviews. No surprise. What you want is an xray of your customers mindset when he’s using your product, when he decided to buy, and finding out what is really the job he is solving by using it. So you better start talking, and forget all your assumptions (even if they turn out right). The interview style is pretty interesting: laid back and trying not to be leading you walk your customers along a scripted timeline. I liked it. Seems like my former journalistic life not only lead to excessive noseyness (an occupational hazard). But then, I had some help (thanks, Tor) and many helpful resources. The Jobs be Done Handbook might look rather pricey for being a self-published booklet of just a handful of pages and really hideous typesetting. But hey, it get’s its job done. More of a challenge: most scripts, guides to scripts and examples of interviews out there are geared towards real products, bricks and mortar style. Tangible goods. Which makes it a bit hard to follow advice like “build around the Point of Sales“. As the PoS will be most likely your customer’s living room. But hey, I got it to work. It’s just that the how part might have to become another post.